It’s been amazing who I’ve met these past few months, and they all seem interconnected in some way to help others. Sarah Jane Lee is no exception. Sarah is an experienced actor, storyteller, drama workshop creator, school teacher, singer, voice over artist, and many other ‘things’ besides. Sarah Jane ran the RSC storytelling workshops for 9 years, after she completed an MA in Drama Education. A woman of many talents! What’s your story? We all have one of course. I am fascinated by stories. I love the fact that, no matter what, we can find a connection through story. We might connect to someone else’s true story, to a work of fiction, to just a word or a phrase. Or it’s just the sharing and telling that makes it. When we make stories together, we can contribute our experiences, thoughts, imaginings, memories, even songs into one big, fabulous story. It may just be one word or someone starts a song and knows every word, a laugh, a shout. Whatever, we make, we make something true and beautiful that resonates in all of our hearts – because we made it. It brings us together. We read it back. We laugh, maybe have a song, and we definitely have fun! I use drama to teach humanities, RE and literacy. Many children, (especially those struggling with traditional methods), connect through the drama process. I work in a very structured way, scaffolding the work carefully unravelling the subject matter through stories. I never say, “Make up a play”. I ask, “How do you think the girl in the factory feels at this moment? Let’s ask her”. It’s intricate work – not drama games – and it is very liberating. Sarah is an experienced Drama Practitioner & Actor with a PGCE in Drama and an MA in Drama & Theatre Education. She trained with Professor Jonothan Neelands and Dr Joe Winston at The University of Warwick in 2007. 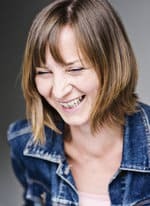 Her work includes interactive storytelling for families using Shakespeare, teaching drama in schools, supporting Shakespeare festivals and directing and developing film projects with homeless and vulnerable adults in Manchester. Sarah’s has an impressive list of clients including: The Royal Exchange Theatre, Manchester, The Lowry Theatre, Manchester, The Royal Shakespeare Company, The National Theatre Company, North West Drama, Manchester, Acting On Impulse Registered Charity, West Midlands Library Service, The Cheltenham Literature Festival, and many North West schools.